Stop right there. Go to the store. Purchase the items to make this candy. Come home and make the candy. Watch it disappear. Seriously this is that good. Since it is summer I don’t want my oven on long and I don’t have much time with all 4 kids out of school to make treats. These are perfect on both accounts. Quick, delicious and doesn’t heat up the house. Sounds like the perfect combo to me! I plan to make more just before school to give to the teachers to give them that extra umph to get through those long first days. 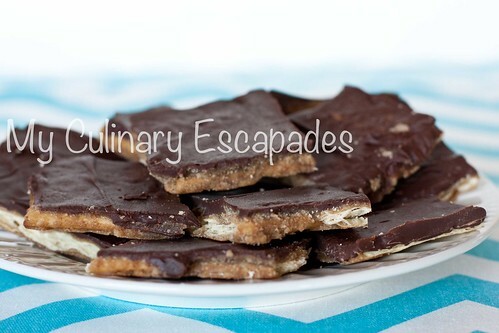 This toffee is so easy to make and so delicious to enjoy it is sure to become your favorite treat. Line half sheet pan with foil and spray with cooking spray. Place a single layer of saltines in the pan. In a saucepan heat butter and brown sugar until sugar has dissolved. This takes between 3 and 5 minutes. Immediately pour over saltines once it has dissolved and spread it to cover the crackers using your offset spatula or heat resistant spatula. Bake at 400 degrees for 5-6 minutes or until toffee is bubbly. Remove from oven and sprinkle with the chocolate chips. Do not try to spread chips until they are melted. This takes about 5 minutes. Spread chips on top of the toffee and cool completely. I like to cool mine in the freezer because I tend to be impatient when it comes to saltine toffee. Once cool break the toffee into piece and enjoy.